When discussing choices about upholstery, zippers on the back of cushions frequently come up. People like zippers because they want to be able to remove the cover for cleaning. That’s not the purpose of zippers. They are used to close a cushion after filling because it is much less time consuming to install a zipper than to hand sew a cushion. A properly filled cushion is extremely difficult for a non-professional to fill. 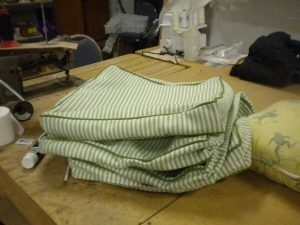 The filling should be oversize to the cushion in order to have a snug fit, thus the struggle with a cover. Some manufacturers have disabled zippers after closing the cushion to discourage removing the cover.